The program of the workshop has been published. It includes nine full papers and one invited talk by Maria Luisa Damiani from the University Milan about Moving objects beyond raw and semantic trajectories. 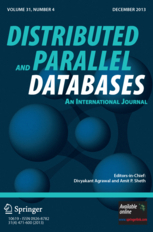 The best papers of the workshop will be invited to a special issue in the journal on Distributed and Parallel Databases. See the call for papers of the special issue for more details. The submission deadline has been extended to June 17. The increasing functionality and capacity of mobile devices have enabled new mobile applications which require new approaches for data management. Users want to have a seamless integration of their data on their mobile with other devices, which can be either classical devices such as a desktop PC or other mobile devices in their current context. Although the capabilities of mobile devices are growing, their limitations have to be taken into account when designing efficient and effective mobile applications. For example, constraints on energy, CPU power, storage, display size, communication bandwidth, and real-time capabilities have to be considered. Information management in mobile applications is a complex problem space which requires the consideration of the aforementioned constraints. In addition, mobile data can have various forms, such as sensor data, user profiles & user context, spatial data, and multimedia data. Smartphones, mobile and wearable sensors, and other portable systems are used in various applications to collect, process, and exchange an increasing amount of data. Applications can run on several devices (mobile, PCs, multimedia), but the exchange, the integration, and the querying of data between these devices remains a challenging problem. This workshop aims at providing a discussion forum for recent research in this area. The International Workshop on Information Management for Mobile Applications (IMMoA'13) is a continuation of the successful IMMoA and HIMoA workshops in the previous years. It aims at a broad range of mobile application fields: Business, (Serious) Games, Leisure, and Transport. The previous editions of the workshop were held at VLDB 2012 in Istanbul, Turkey (IMMoA 2012) and MDM 2011 in Lulea, Sweden (HIMoA 2011). The workshops had more than 10 submissions each and about 40% of the papers were accepted for presentation at the workshops. Furthermore, the workshops had invited speakers (Daniela Nicklas from Carl von Ossietzky Universität Oldenburg, Germany, and Upkar Varshney from Georgia State University, Atlanta, USA). The workshops were concluded by a lively discussion about the current and future challenges in mobile applications. About 20 researchers participated in each of the events. As a follow-up to the workshop, a special issue in the journal of Pervasive and Mobile Computing has been organized. The special issue received more than 30 submissions which are currently under review. The International Workshop on Information Management for Mobile Applications (IMMoA'13) targets to provide a forum for discussion about technologies and mechanisms, which support the management of mobile, complex, integrated, distributed, and heterogeneous data-focused applications. The workshop is held in conjunction with VLDB 2013 as the workshop addresses important subareas in data management.